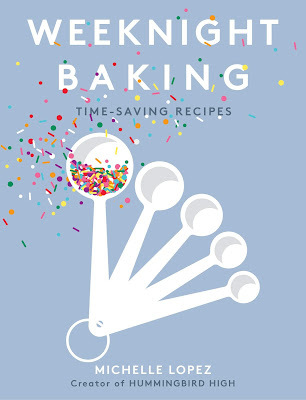 Now that the second pass of the #weeknightbakingbook manuscript has been is almost turned in, I'm starting to catch up with everything I've pushed to the back burner. Unfortunately, most of that list is pretty boring and involves tasks like going to the optometrist, filling out paperwork for my accountant, and so on. But occasionally there's a fun project I get to tackle and am excited about — like the #tenyearchallenge! Because ten years later, I finally see how special 2009 was — it was the funnest, most carefree, tumultuous, and distressing year of my life all at once. In 2009, I was 21 years old and halfway through my senior year at a small, esoteric liberal arts college in Portland. At the start of the year, I was mostly concerned with finishing my economics thesis in time for graduation, and, I'm embarrassed to say this, boys (I hesitate to say "men" because quite frankly, at 21, the boys I liked were honestly just that: boys). My second semester was particularly fun because aside from my thesis, I'd finished the rest of my graduation requirements and was only taking two easy classes that fell on Tuesdays and Thursdays, leaving me with the rest of the week to "work on my thesis". And while I did work on my thesis, I spent a fair number of days passing time in fun, almost idyllic ways: riding my bike to explore the city (2009 was the year I really, truly fell in love with Portland, a love affair that continues today), going to indie music concerts with my best friend at the time, Leah; training for a half marathon by running long distances with Erlend (we hadn't started dating, but would later do so in the fall of that year — more to come); playing drinking games with my roommate Kevin in our apartment, and hanging out at the pub at the end of the universe my street with two British exchange students, Kiron and Myles. It was also around that time that, flush with all that freedom and lack of meaningful adult responsibilities, I started baking from scratch. 2009 me was pretty proud of these cookies — proud enough of them to take "styled" photos on her janky point-and-shoot digital camera, that's for sure. 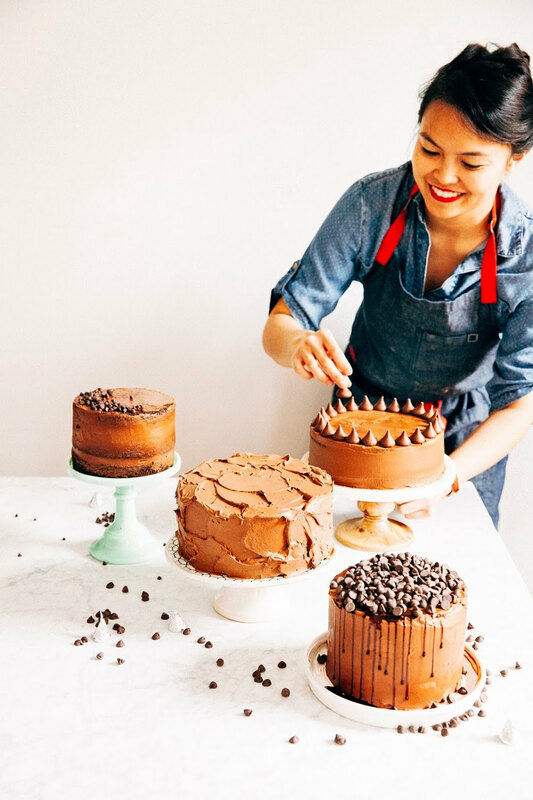 Even then, as inexperienced as I was, I was already prone to playing around and taking risks in my baking. Kevin and I lived a stone's throw away from Trader Joe's, and our apartment would often be littered their snacks. In particular, we were fond of the kind that came in those plastic tubs — the chocolate-covered nuts, caramels, and mini chocolate peanut butter cups. One night, while attempting to make white chocolate and macadamia nut cookies, I realized I'd forgotten the macadamia nuts (yes, one of the main ingredients — you can see how on top of it my 21-year-old self was, lol), saw a half-eaten tub of mini peanut butter cups out of the corner of my eye, and used them in place of the nuts instead. So as part of the #tenyearchallenge, I DECIDED TO RECREATE THEM. Honestly, ten years later, I think that the combination of white chocolate AND chocolate peanut butter cups is kinda, erm, intense. And this is coming from me, the owner of the world's most massive sweet tooth! But no matter. I've upgraded the recipe to reflect my ten years of baking knowledge: I skipped the Nestle Tollhouse base for a brown butter variation of one of my favorite chocolate chip cookie recipes, and I used chopped white chocolate in place of chips. However, the mini peanut butter cups get to stay — even in 2019, they still remain one my favorite snacks from Trader Joe's. Enjoy! Mini peanut butter cups are available at Trader Joe's via their generic brand; I also similar ones by Reese's at Target. Don't get these confused with their "miniatures", which are slightly smaller than their regular sized peanut butter cups but aren't as small as these guys. You want the kind that are unwrapped and in a big bag, similar to how chocolate chips are usually packaged. 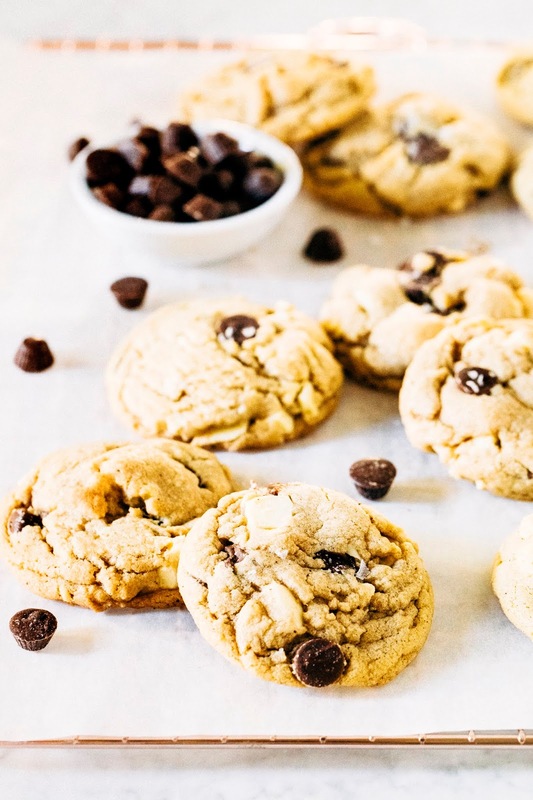 The peanut butter cups and white chocolate chunks don't spread too much when they're baked; as a result, your cookies will be wider and thicker than regular chocolate chip cookies — kinda similar to those famous cookies from Levain. 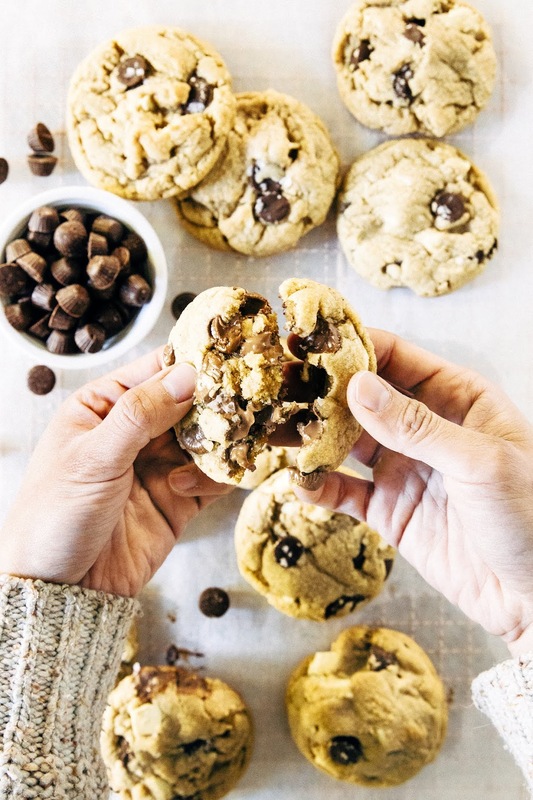 The cookies are best when they're ten minutes out of the oven; breaking them in half will reveal a gooey center with molten chunks of peanut butter. 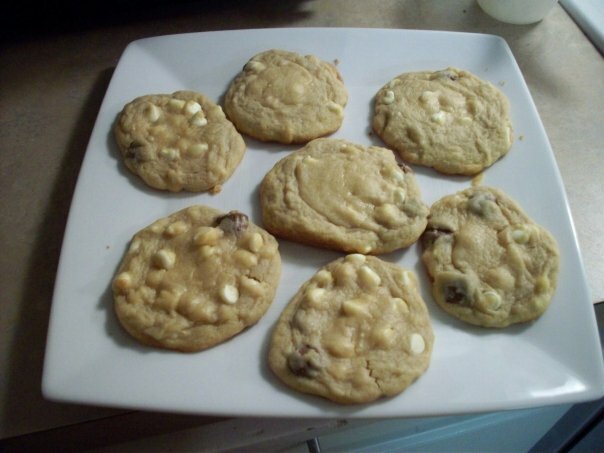 In a pinch, pop one in the microwave and reheat for 10 seconds to make the cookie molten again. Melt the butter in a medium, heavy bottomed sauce pan over medium heat. Cook, stirring occasionally with a heatproof rubber spatula, until the butter turns a speckled amber color and smells nutty, about 5 minutes. The butter will bubble violently and turn foamy; use the spatula to skim the foam aside to see the color of your butter. Immediately remove the butter from heat and pour into the bowl of a stand mixer fitted with a paddle attachment. 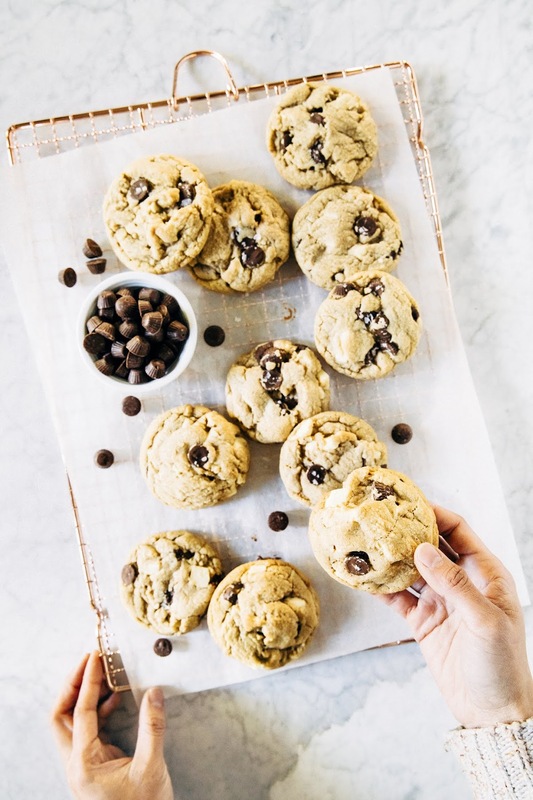 While the butter cools slightly, prep your other ingredients: whisk together 1 2/3 cup (7.5 ounces) all-purpose flour, 1/2 teaspoon baking powder, 1/2 teaspoon baking soda, and 1 teaspoon kosher salt. Return to the butter and add 3/4 cup brown sugar, 1/4 cup granulated sugar, and 2 teaspoons vanilla. Beat on low until combined. Add 1 large egg, and continue beating on low to incorporate. Use a rubber spatula to scrape down the bottom and sides of the bowl. With the mixer on its lowest setting, gradually add the dry ingredients. Beat until just combined. Mix in 4 ounces chopped white chocolate and 4 ounces mini peanut butter cups by hand with a rubber spatula. 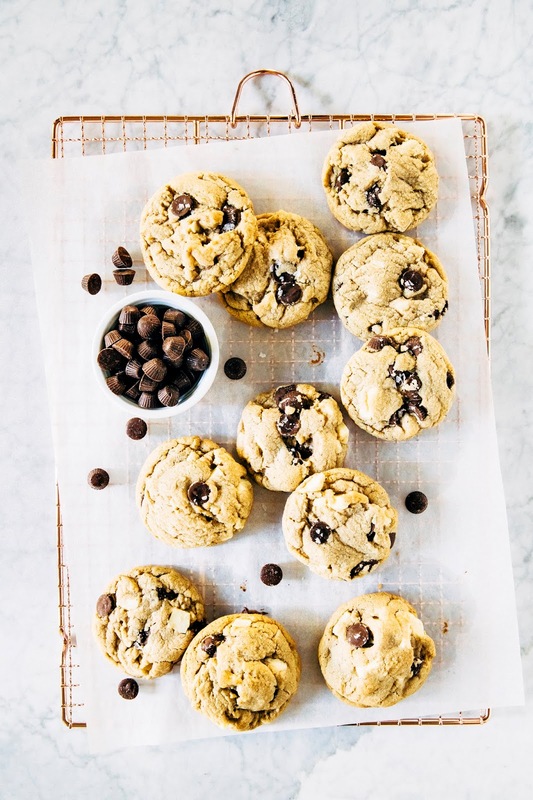 Use a 4-tablespoon cookie dough scoop to portion out cookie dough balls and place 6 on each sheet pan, leaving at least 3-inches between each cookie. Give each ball a small smoosh to flatten them slightly with the palm of your hand. Bake for 10 minutes, or until the edges have set and the centers are still gooey. Cool the cookies on their sheet pan on a wire rack for 10 minutes, or until the edges and bottoms of the cookies have set and feel firm to the touch. Serve the cookies warm, or at room temperature. 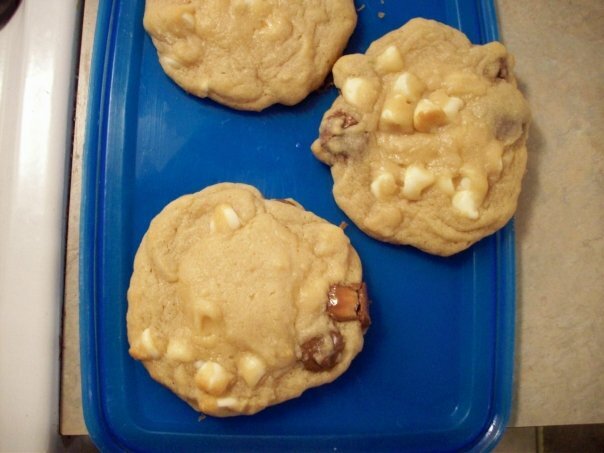 The cookies can be kept at room temperature, in an airtight container or Ziploc bag, for up to 3 days.